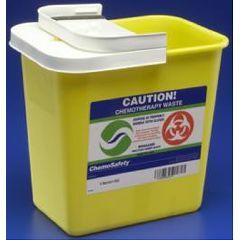 SharpSafety™ Chemotherapy Sharps Container is for disposal of chemotherapy waste. Hinged cover with gasket provides leak resistant containment of fluid. Absorbent pad in bottom of container absorbs excess liquid. Provides temporary and final locking closure for disposal. Yellow non translucent.